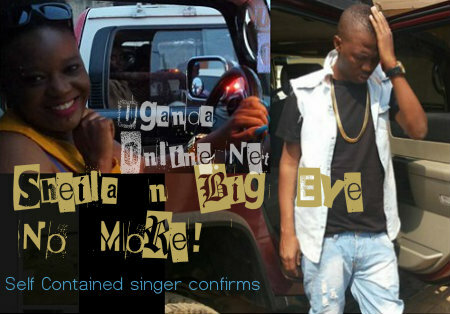 Big Eye's ex-lover, Sheila Patience Nadede, aka Sheila Don Zella has revealed that Big Eye is not the father of her last born, Britton. The 'Batunte' singer was on May 16 celebrating his son's birthday on Facebook when he revealed that he had been denied access to his child. "Always know that daddy loves you so much. Mountains don't meet, but the time comes and human beings meet. One day you will come to daddy in the name of Allah," Ibrahim Mayanja aka Big Eye wrote on his wall. Sheila and Big Eye split bitterly early last year and since then, all the music the singer has been composing has been hitting directly at his ex-lover. 'Batunte' which means; I'm Taken is the latest from the Star Boss. It should also be recalled that Big Eye hooked himself another babe a few weeks back, they got engaged on Facebook. When this got to Sheila, she shot back revealing not so good news to the former Big Talent singer. "Mothers know the best for our children, men, when a chance is given to you use it right don't waste women's time because they can waste yours too. I find it extremely hard for a Ugandan citizen ( KAZO CITIZEN ) claiming to be the father of my son well hope the birth certificate down below will help calm your aZz down.."
"Not because the child has a dark complexion makes him yours, you were not the only man in my life," Sheila concluded.